DEANS, DIRECTORS, AND CHAIRS: If you are a faculty member or a director and your school did not respond fully, now is the time to get started on the next survey. There are three stages in the annual Placements & Salaries Survey. 1. THE SCHOOL MUST PROVIDE THE NAME AND EMAIL OF THE PERSON WHO WILL SERVE AS ITS CONTACT. If you have a new contact, let us know as soon as possible via lgirmscheid@mediasourceinc.com. In early spring 2018, announcements will be emailed to each school contact with survey links and deadline information. 2. SUBMIT THE INSTITUTIONAL SURVEY. The school’s contact responds with the number and gender of graduates, details about placement assistance given, and trends in employment positions. 3. GET THE SURVEY TO 2017 GRADUATES. Send graduates LJ’s survey link, or choose to conduct an independent survey and share your raw data with LJ. Numerous outreach efforts may be needed to encourage graduates to participate. GRADUATES: If you are a 2017 graduate, make sure that your institution has your current email address. 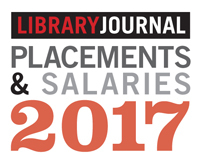 Ask to be included in LJ’s Placement & Salaries Survey of 2017 Graduates.